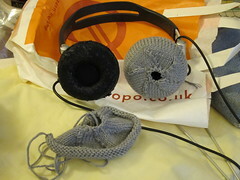 Cast off, leaving a thread long enough to sew up the edges and gather round the ear piece. Check it against the ear piece. It should fit over with just a bit of stretching. If it doesn't fit, note down what to try different and pull it out and start over. If it does fit, start the sewing up with the thread left at the end, then put the cover on the ear piece to sew it over the wires, then continue the thread around the outer edge gathering it to fit. Tie it off to the thread at the start of the piece and trim or tuck in the ends. Put them on, plug them in and play some good tunes. Now, that's the way I've done it, but I have a feeling there's loads of tweaks and improvements that could be made. 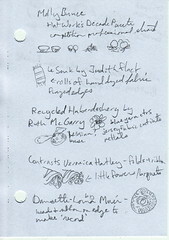 I'm not that great at knitting, so adding patterns, ruffles, tassells, etc. is a bit beyond me, but the headphone covers as an idea could definitely be taken further. Or, the covers can be simple and functional, like mine. 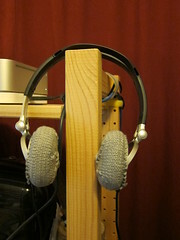 The good: The covers have made the headphones usable again, which is nice. And I do like the way they are 'peronalized' now. The bad: Because this project sat in my to-do pile so long (and by that I do mean years), P has new headphones and so doesn't need these now. The ugly: I am a bit bothered by the way the casting off stitches stand up. This is probably due to my awkwardness in casting off rather than the pattern itself. I was knitting on the bus this morning, and I overheard a kid talking to a friend. "I don't know how you'd get there. Oh, you could walk! Because you have legs!" I am so mature, that I concentrated on the knitting until they got off to go to school. Then I started giggling. Makes me glad to have legs. On the way home, a bit of a faux pas. I didn't realize the older lady getting on the crowded bus really did need to sit. Luckily, a woman sitting behind me did realize and gave up her seat. Feel like I didn't read the situation as well as I should have.